Qingdao Jiaodong International Airport will help Qingdao to become an international metropolis and reshape the aviation network in Northeast Asia, according to the city government. The new airport, which is currently under construction, is located in Jiaozhou on the outskirts of Qingdao, approximately 39 kilometers from the city's downtown area. It has attracted a total investment of more than 44.3 billion yuan ($6.45 billion). The first phase of construction is due to be completed by 2025 and will feature a 478,000-square-meter terminal and 178 landing slots. It is expected to handle 35 million passengers, 500,000 metric tons of cargo and nearly 300,000 aircraft annually. When the project is fully finished in 2045, its terminal area will be increased to 700,000 sq m and the new airport should be able to serve 55 million passengers yearly. Jiaodong airport, which is expected to be operational by the end of 2019, has been designed to become the first Chinese airport with direct high-speed train and subway links, in a bid to grant passengers from both the downtown area of Qingdao and its neighboring cities more convenient access. According to Qingdao Airport Group, the new airport will replace the existing Qingdao Liuting International Airport as the city's main airport to meet the increasing demand for flights. Liuting airport, which has been operational since 1982, offers 146 regular routes linking Qingdao to 86 domestic and overseas destinations. In 2016, the airport set a new record for its passenger throughput by serving more than 20 million passengers in a single year, passing the figure on Dec 22. 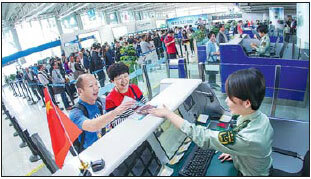 Yu Fuquan, deputy general manager of Qingdao International Airport Management Corp, said that every 1 million air passengers passing through the airport yield economic benefits to the tune of 1.81 billion yuan, and, as a result, the contribution to Qingdao's GDP from a passenger throughput of 20 million would be considerable. The airport's passenger throughput record marked a new golden period in its development, and means that it will provide strong support for Qingdao's development strategy of building three centers and one base, which refers to an innovation center, a regional service center, an internationally-advanced center for oceanic development and an advanced manufacturing base, Yu said. Airport passenger throughput is an important indicator for assessing a city's economic strength. During the 12th Five-Year Plan (2011-15) period, Liuting airport witnessed a steady increase in passenger throughput, with average annual growth of 8.4 percent. It handled 11.7 million passengers in 2011 and 18.2 million in 2015. In November 2016, the airport's annual throughput of passengers entering and exiting China exceeded 3 million for the first time. Chinese passengers accounted for 58.8 percent of this number, followed by South Korean passengers, 26.3 percent, and Japanese passengers, 5 percent. The Qingdao government has placed heavy emphasis on the development of international flight routes, which indicates the central role they are expected to play in pushing forward the city's international strategy. Last year, Liuting airport launched several international routes. On March 29, a direct flight between Qingdao and Frankfurt started operation. On Sept 29, direct routes linking the city with San Francisco and Melbourne opened. On Dec 30, a Qingdao-Vancouver route was launched. The airport will continue to focus on developing direct flights to Los Angeles, London, Sydney, Moscow, Dubai and Madrid this year.